Recent studies among middle and high school aged kids across the country show a disturbing form of substance abuse among teens: the intentional abuse of otherwise beneficial medications, both prescription (Rx) and over-the-counter (OTC), to get high. According to surveys from the National Institute on Drug Abuse, 20 percent of these teens say they have taken a prescription drug without having a prescription for it themselves, and 5 percent report abusing OTC cough medicine to get high. While prescription medicines benefit many different people – for many different conditions – when used appropriately, they are being increasingly misused and abused. In fact, behind alcohol and marijuana, the most common drugs teens abuse are prescription medications. The most commonly abused prescription medications are opioids and pain relievers (Vicodin®, OxyContin®), barbiturates and benzodiazepines (Valium®, Xanax®) and stimulants (Dexedrine® or Adderall®, Ritalin® or Concerta®). Teens who learn about the risks of drugs from their parents are 50 percent less likely to use drugs. So we ask you to take action, talk to your children and teens today about the risks of medicine abuse and overdose. We also ask that you safely dispose of your medicine through our Medicine Take Back Program. In addition, it is very important that you safegaurd your medicine cabinets throughout your home. 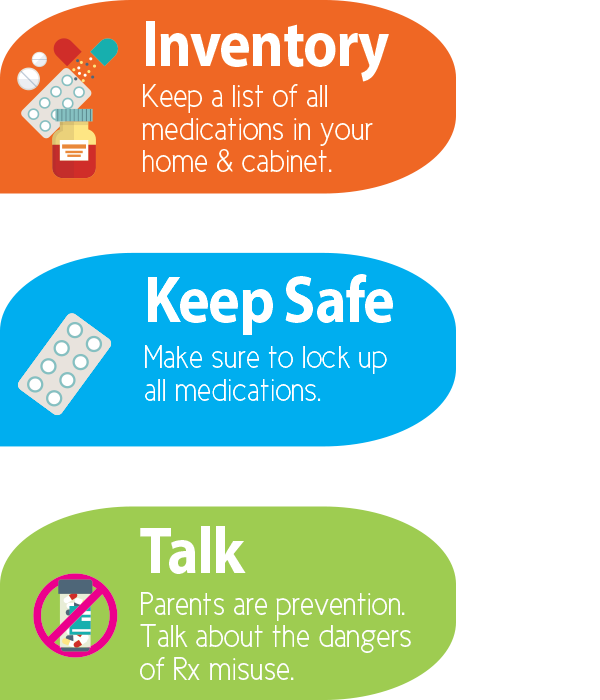 Know what medications you have and how much, so you will know if anything is missing. Properly discard of any medicines you no longer need. When medicine is no longer needed, it is important to dispose of expired, unwanted, or unused medicines from your home as quickly as possible to help reduce the chance that others may accidentally take or intentionally misuse the unneeded medicine. Do you need conversation starters? Ice breakers or just knowing how to have a conversation with your child about the dangers of prescription abuse? We have partnered with TalkSooner, an app available for download through Apple AppStore or Google Play that will help in providing everything you need to have a productive conversation. In addition, you can visit their website for specific information on prescription abuse. The Barry County Substance Abuse Task Force is an educational collaboration and does not provide direct substance use disorder treatment services. If you are looking for treatment services or to talk with someone about substance abuse services, please call the Barry County Mental Health Authority at 269-948-8041. Substance abuse emergencies or crisis can happen late at night or on weekends. Services are available 24/7 to assist those in need. 1-800-273-TALK (8255). We can all help prevent suicide. 24/7. Free. Confidential.